A four-wheeled wooden vehicle that is pulled by draft animals such as oxen and horses. They generally have metal wheels and a suspension system to help navigate. These vehicles have been used for the last 2,000 years; however, with the advent of motorized vehicles they have fallen into disuse. 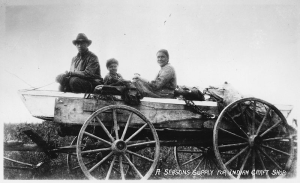 "Family and goods in wagon. White Earth Reservation, Minnesota, 1934" by U.S. National Archives and Records Administration is licensed under Public Domain.